Cook the turkey breast ahead of time and cut into small pieces. (I like to poach it and then squeeze out the excess water when cubing or shredding.) Place turkey in a large bowl. Chop the eggs, pickles, celery and apples into small cubes and add to the bowl with the turkey. Add the almonds, ground or sliced to your preference. Whisk together the mayonnaise, lemon juice, and spices (salt, curry powder, ginger, nutmeg) and then pour over turkey mixture. Stir well, making sure to fold over from the side to avoid crushing the ingredients. 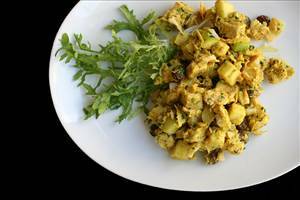 There are 201 calories in 1 serving of Curried Turkey Salad. Calorie break-down: 44% fat, 29% carbs, 27% protein.